History of the Wars, published for the first time in English, is one of the few non-Persian primary sources on the history of Persia (Iran) and Transcaucasia in the first half of the eighteenth century. 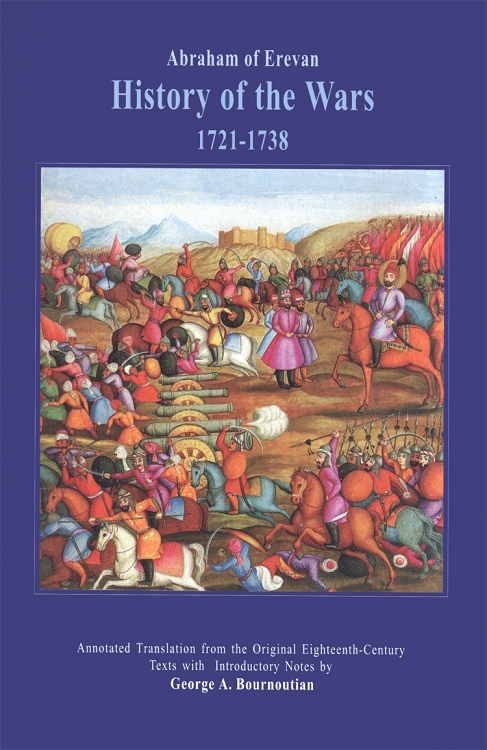 It details the Afghan and Ottoman invasion and occupation of Persia and Transcaucasia, the efforts of Shah Tahmasp II to restore the Safavid dynasty, the rise of Nader Khan Afsar, Nader's campaigns against the Afghans and Ottomans, the restoration of the territorial integrity of the Persian state, the coronoation of Nader Shah and the establishment of a new dynasty in Persia. Unlike other contemporary sources, which concentrate on the political and sociopolitical conditions of the region, Abraham's History is an uninterrupted account of the wars between the Persians and the Afghans; the Ottomans and the Afghans; and the Persians and the Ottomans. Abraham was an eyewitness to the Ottoman invasion of eastern Armenia and the Ottoman siege of Erevan. His account mentions individuals, events and geographic locations not detailed anywhere else. The work's greatest value, however, is its information on the Armenians. Abraham's detailed account of the Turkish invasion of eastern Armenia is the sole source on the events that occurred in the region from March through September 1724. He provides a vivid physical description of Erevan, its various districts and neighborhoods, its churches and its citizens.